When you need to connect with customers that can make a real difference to your business, put your business on Thomasnet.com. As the leading platform for supplier discovery, product sourcing, and actionable information, we are the go-to source for a powerful, global audience of procurement professionals and engineers. Stand out and get found on industry’s total sourcing platform. Thomasnet.com lets you promote far more detailed information than you could on any online directory or general search engine. 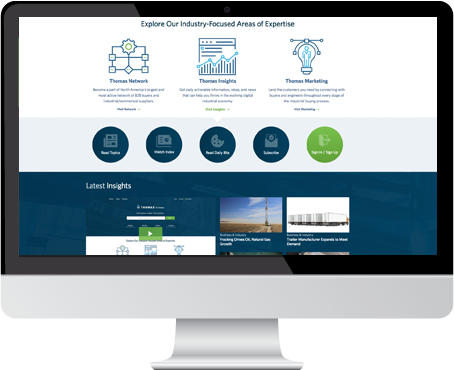 And that’s exactly why buyers and engineers come to us when they’re serious about partnering with a new supplier – they’re able to discover, vet, compare, and contact industrial suppliers, all on one comprehensive, free platform. Promote your company on the world’s most frequently searched industrial supplier database. Turn your detailed product data into sales by making it searchable online. Get spec’d into more designs by making your 2D/3D CAD drawings searchable and available for download. Let us connect you with local customers looking for exactly what your job shop provides. Stand out to large organizations that need to fulfill supplier diversity requirements. Qualify your company for buyers who require your achieved industry certifications.